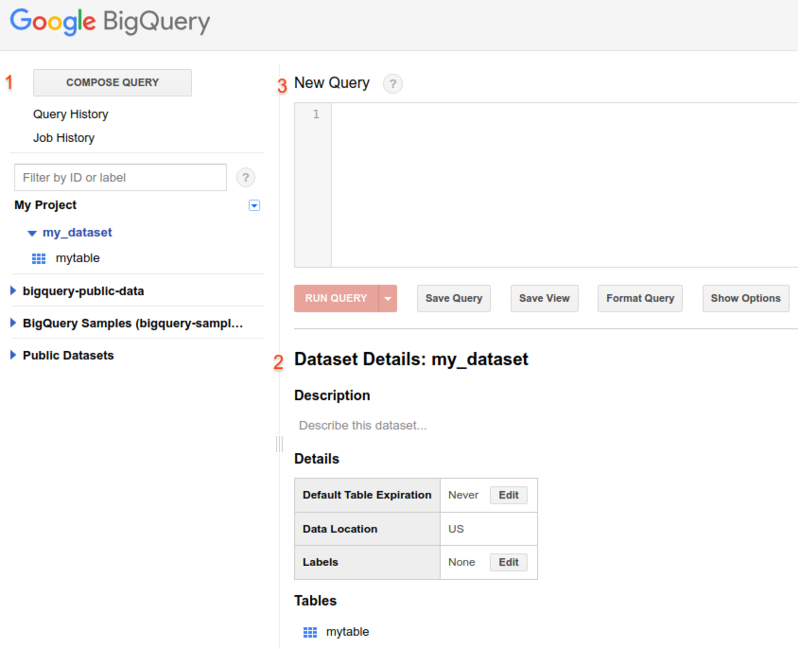 BigQuery exposes two graphical web UI's that you can use to create and manage BigQuery resources and to run SQL queries: the BigQuery web UI in the GCP Console and the classic BigQuery web UI. This page introduces the classic web UI. Before you can use the classic BigQuery web UI, you must create or select a project and enable billing using the GCP Console. Clicking the button below will open the web UI using your most recently accessed project. The top half of the navigation pane contains a list of items describing what action you want to perform: compose a query, see query history, or see job history. The bottom half of the navigation pane contains a list of datasets in the current project that you have access to, plus the BigQuery public datasets. A filter box is available that allows you to filter by dataset ID or label. Contains information appropriate to the selected action in the navigation pane. For example, if you click a dataset in the navigation pane, the details pane displays information about the dataset. When you click Compose Query, a New Query window is added above the details pane. This window can be closed when you no longer need it. The navigation pane lists datasets that you can browse in the current project. Click the icon next to any dataset or click the dataset's name to expand it and to show the tables within that dataset. Clicking a table will show information about the table in the details pane. You can then click the Query Table button on the right side of the pane to populate the query box with a basic query for that table. You can modify the query by hand to specify fields or customize the query however you like. You are not limited to querying the currently selected table. For more information on querying tables, see Running interactive queries. All of your BigQuery work is done within a project. This project's name can be seen in the navigation pane above the list of datasets. All your work within the project is charged to the billing account attached to the project. For more information on BigQuery charges, see the Pricing page. You can add or "pin" a project in the classic web UI using the project drop-down menu. Click the down arrow icon next to your project name in the navigation pane. In the drop-down menu, click Switch to project > Display project. Leave Display project in navigation panel selected. Click OK to add the project to the navigation panel. Click the down arrow icon next to the project name in the navigation pane. In the drop-down menu, click Remove project from panel. If you prefer to switch to another project (instead of pinning it in the UI), you can use the context menu. In the drop-down menu, click Switch to project and choose the project from the list. This replaces your previous project in the UI with the one you chose. It is possible for another user to share a dataset with you without giving you access to the corresponding project. If that happens, you should receive an email with the name of the project that contains the shared dataset. The project and dataset do not automatically appear in the classic UI. If you click the browser tool link in the email, the web UI opens with the project displayed. If you prefer to pin the project containing the shared dataset, follow the steps for Adding a project. As you run jobs and run queries using the classic web UI, your history is preserved in the navigation pane. Queries are also a type of job, but your query history is preserved separately for ease of use. Click the Job History link in the navigation pane. You can repeat a load job by using the web UI, but you cannot repeat an export or copy job. Click the Query History link in the navigation pane. You can repeat a query job by using the web UI. You can filter (or search) your query history or job history to show only particular jobs that meet your criteria. The results returned are limited to the pool of jobs retrieved by the classic UI. By default, the classic UI allows you to search the 1,000 most recent jobs. In the navigation pane, click either Job History or Query History. Click the "filter jobs" drop-down to open the filter expression box. Click Any to choose a filter criteria. Click the operator drop-down and choose an operator. Depending on the criteria you chose, the operator list changes. For example, if you choose a text criteria, the operator list includes substring and regex. Enter a value in the box. Click And to add an optional, additional criteria to the filter. Job ID (jobid) — The job's unique, opaque ID. User (user) — The user that submitted the job. Start Time (start) — Start time of the job, in milliseconds since the epoch. This property is present when the job transitions from the PENDING state to either RUNNING or DONE. End Time (end) — End time of the job, in milliseconds since the epoch. This property is present whenever a job is in the DONE state. Destination table (dest) — The name of the destination table for the job operation (load, copy, or query). Query text — The text of the submitted SQL query. Bytes processed — The total number of bytes processed by the SQL query. UDF code — An inline resource that contains code for a user-defined function (UDF). Title (title) — The title as it's displayed in the history, for example, the title of a load job might be: "uploaded file to myproject:mydataset.mytable". Type (type) — The job type: load, query, copy, or extract (export). Copy source (copysrc) — The source table in a copy job. Destination URI (desturi) — The Cloud Storage destination URI for an extract (export) job. Source table (srctable) — The source table in an extract job. Source URI (srcuri) — The Cloud Storage source URI for a load job. You can also sort your query history in the classic UI by using the Sort By option in the Queries pane. The Queries pane opens when you click Query History in the navigation pane. Date — Sorts queries by the run date. Duration — Sorts queries by total run time. Duration/byte — Sorts queries by duration, normalized by input bytes. This allows you to compare the run time of queries with varying input sizes. For example, you might have a set of tables that grow over time and want to compare the efficiency of your queries while discounting the difference that is only caused by the change in input size. This assumes that the relationship between input size and runtime is linear. Input bytes — Sorts queries by bytes read. Slot-ms — Sorts queries by the sum of milliseconds active across all slots used by the query. Sorting by slot-ms is a more stable measure of processing effort because it is less affected by system delays and other sources of uncertainty that can impact the observed duration. Slot-ms/byte — Similar to Duration/byte, Slot-ms/byte is a normalized form of slot-ms.
Only 1,000 datasets can be displayed in the navigation pane. Up to 30,000 tables are displayed in the navigation pane per project. You can find classic web UI examples throughout the How-to guides section of the BigQuery documentation. Below are links to common web UI tasks such as running queries and creating, getting, listing, deleting, and modifying BigQuery resources.